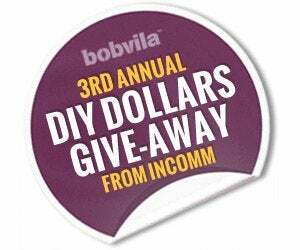 Enter Bob Vila’s 3rd Annual DIY Dollars Give-Away from InComm—TODAY! Enter today and every day in April for your chance to win $1,000 in Do It Yourself Home Improvement™ gift cards from InComm! Spring has officially sprung, and that means relaxing outdoors with friends and family. But for many homeowners, warmer weather means it’s time to play catch-up on home improvement projects. So, this month we’re giving away four weekly prizes of $1,000 in Do It Yourself Home Improvement™ gift cards, courtesy of our friends at InComm! So step up your home’s curb appeal, build a patio, or renovate the deck; the choice is yours if you win this month’s give-away! Redeem your Do It Yourself Home Improvement™ gift cards from InComm at thousands of home improvement retailers in the U.S. where Discover cards are accepted, including True Value, Home Depot, Sherwin Williams, Sears, Restoration Hardware, Menard’s, and more! What could you do with an extra $1,000 in your pocket this spring? Would you put it towards replacing your kitchen countertops, buy a new grill, or install an outdoor movie screen? The limit is your imagination! Start daydreaming, and enter Bob Vila’s 3rd Annual DIY Dollars Give-Away today and every day to increase your chances of winning. To learn more about InComm and their products, click here. The “Bob Vila’s 3rd Annual DIY Dollars Giveaway from InComm” sweepstakes is open only to permanent legal U.S. residents of the 48 contiguous states and the District of Columbia; residents of Alaska and Hawaii are not eligible. Void in all other geographic locations. No purchase necessary. Contest Period runs from 12:00 p.m. (EST) Tuesday, March 31st, 2015 through 11:59 a.m. (EST) Thursday, April 30th, 2015. One entry per household per day on BobVila.com. Alternative means of entry for Drawing is available by faxing your name and address to 508-437-8486 during the applicable Entry Period. Odds of winning depend on the number of eligible entries received. See Official Rules. 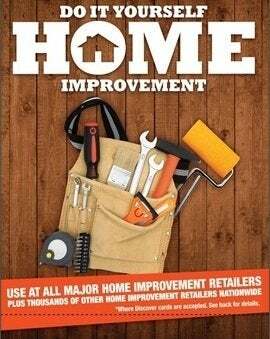 The Do It Yourself Home Improvement gift card is issued by The Bancorp Bank; Member FDIC. Discover® and the Discover acceptance mark are service marks used by the Bancorp Bank under license from Discover Financial Services. Card is distributed and serviced by ITC Financial Licenses, Inc., which is Licensed as a Money Transmitter by the New York State Department of Financial Services. Card may be used at identified home improvement retailers in the U.S. everywhere Discover Cards are accepted. Terms and conditions apply – see Cardholder Agreement.